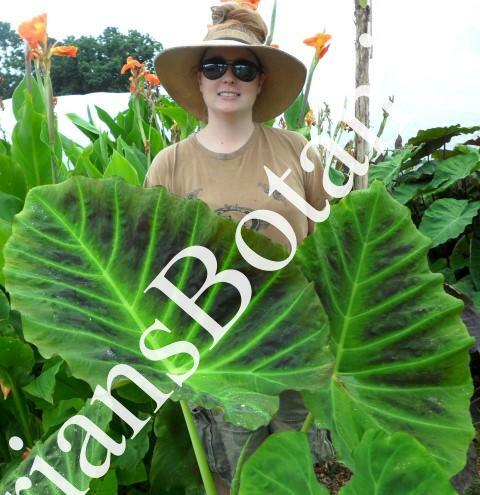 Another colossal-sized Colocasia from the Gigante Series,Colocasia ‘Imperial’ gigante?PP26,152 looks like an Illustris on steroids. Massive black leaves are particularly ornate, accented by light-green veins and stems. Robust in nature, these 3-4′ long leaves are held horizontally like giant fan blades. Green flowers emerge with white spaths. A clumping form, plants can grow 5-8′ tall in a single season. This is the perfect plant for the impatient gardener! Due to the size of its leaves, it is best to site it in protected areas away from strong winds with 4-8 hours of full sun.